Guardian of the treasury at Jerusalem. In the last days of Jerusalem, in the year 70 C.E., he followed the example of his priestly colleague Jesus b. Thebouthi, and betrayed his trust; collecting many of the linen coats of the priests, their girdles, much purple and silk which had been prepared for the sacred curtain, and the costly spices for the holy incense, to save his life he went over to the Romans (Josephus, "B. J." vi. 8, § 3). He appears to be identical with the Phinehas mentioned in the Mishnah Sheḳalim v. 1, who was guardian of the sacred wardrobe. 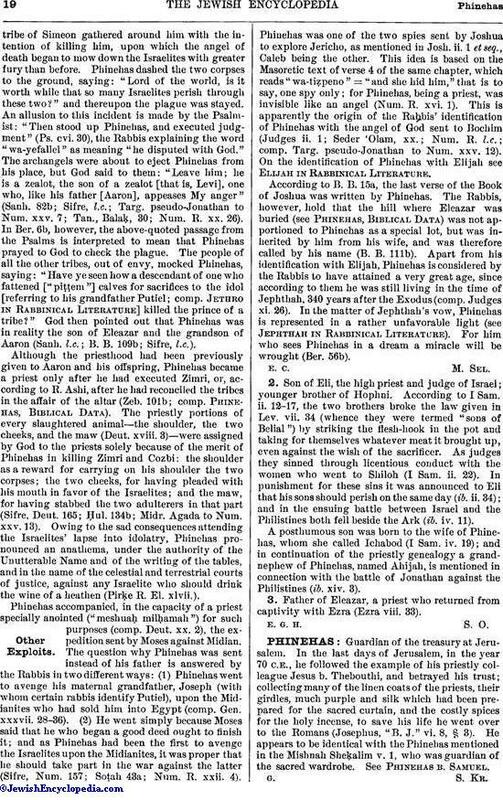 See Phinehas b. Samuel.